Advertising and Multilingual Repertoires explores advertising from the perspective of multilingual audiences. 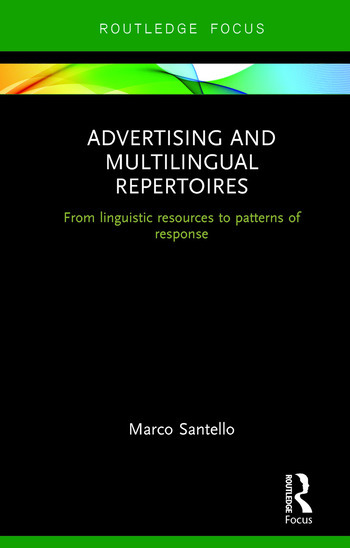 Santello introduces the key linguistic processes involved in advertising discourse, and analyses the relationship between the linguistic repertoires of audiences and language use in advertising. Demonstrates both qualitative and quantitative approaches to researching the intersections between language and marketing. Advertising and Multilingual Repertoires is key reading for postgraduate students and researchers in the field of language and advertising. "In Advertising and Multilingual Repertoires, Marco Santello proposes a new theoretical framework for analyzing multilingualism and advertising that draws on both marketing principles and sociolinguistics. This volume includes an extensive review of the literature on multilingual advertising campaigns as well as effective linguistic strategies used in advertising targeting multilinguals."